Imagine a book about an unnecessary war written by the ruthless general of an occupying armyâ "a vivid and dramatic propaganda piece that forces the reader to identify with the conquerors and that is designed, like the war itself, to fuel the limitless political ambitions of the author. Could such a campaign autobiography ever be a great work of literatureâ "perhaps even one of the greatest? It would be easy to think not, but such a book existsâ "and it helped transform Julius Caesar from a politician on the make into the Caesar of legend. This remarkable new translation of Caesarâ (TM)s famous but underappreciated War for Gaul captures, like never before in English, the gripping and powerfully concise style of the future emperorâ (TM)s dispatches from the front lines in what are today France, Belgium, Germany, and Switzerland. 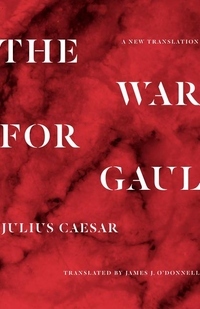 While letting Caesar tell his battle stories in his own way, distinguished classicist James Oâ (TM)Donnell also fills in the rest of the story in a substantial introduction and notes that together explain why Gaul is the â oebest bad manâ (TM)s book ever writtenâ �â "a great book in which a genuinely bad person offers a bald-faced, amoral description of just how bad he has been.